Preheat the oven to 180°C/Gas Mark 4. In a 3 and 4 oven Aga, cook in the baking oven, in a 2 oven, in the roasting oven using the cold shelf. Grease and line the base of a round 23cm (9in), 6cm (2in) deep cake tin, spring form if you have one. Mix the breadcrumbs with the sugar, ground almonds and baking powder. Whisk together the oil and the eggs, pour into the dry ingredients and mix well. Add the orange and lemon zest and pour into the prepared tin. Bake for 45 -60 minutes or until the cake is golden brown, and if you insert a skewer into the centre it comes out clean. Keep an eye on it whilst cooking as the high sugar content means the top will colour quickly. Once the cake is cooked leave it in the tin for 5 minutes and then turn it out onto a large plate. To make the citrus syrup, put all the ingredients into a stainless steel saucepan; bring gently to the boil, stirring until the sugar has dissolved completely and simmer for about 3 minutes. While the cake is still warm, pierce it with a skewer. Spoon the hot syrup over the cake and leave to cool. Spoon any excess syrup back over the cake every now and then until all the juice has been completely soaked up. Lay the cinnamon and cloves on top of the cake for decoration and serve with whipped cream, thick Greek yogurt or dairy free alternative. Don’t be fooled by the simplicity of this recipe – it is absolutely delicious and just goes to prove that a few good ingredients can make an amazing dish. I found this recipe in Sally Clarke’s book. When I first cooked it I couldn't believe how simple yet how delicious Apple Brown Betty is. It makes a lovely, light alternative to crumble or pie and is very moreish. 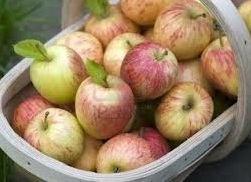 If you want to serve it at the table in a nice gratin or pie dish you can put the cooked apple into the dish and keep warm in the oven, adding the topping as it goes to the table so it doesn't go soggy. You do need to use fresh, bakers bread as the better the bread, the better the crunchy top will be. Place the apples in a heavy stainless steel saucepan with a splash of water, the butter and the sugar. Heat gently on the hob then cover and leave to simmer, stirring occasionally until they become a smooth puree. If you have an Aga, start them off on the top, then transfer to the simmering oven. Meanwhile heat the butter in a shallow heavy based pan. Add the breadcrumbs and stir continuously over a medium heat so they become crisp. Be careful because they will burn easily. When they have turned golden remove them from the heat and stir in the sugar and spices. Allow them to cool. Serve the warm apple in bowls, sprinkled with a generous amount of crumbs and lots of whipped cream or vanilla ice cream. Those who know me know how much I love my jellies, and this recipe is no exception and based on a Nigella Lawson jelly. Any variety of inexpensive sweet wine will work well in this recipe; I tend to use a Muscat– but nothing too syrupy. Leave your fine Sauterne to drink on a special occasion! 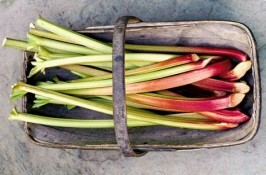 Chop the rhubarb into 2-3cm pieces and place in a large saucepan. Sprinkle over the sugar and add the orange juice, zest, and water. Cover the pan and bring to the boil then simmer until soft. Don’t over cook or the rhubarb juice will lose its lovely pink colour. Once cooked, strain the rhubarb over a large bowl or measuring jug, this should give you about 600-700ml of liquid; you can save the pulp and use it in a crumble or trifle recipe or freeze for another day. Pour the sweet wine into the juice and make up to 900ml. You need to taste it at this point to make sure you don’t need any more sugar, a little more orange juice or a dash more wine. Soak the 8 gelatine leaves in a dish or jug of cold water. Put a couple of ladlefuls of the rhubarb and Muscat juice in a small saucepan to heat through. Take it off the heat before it boils, remove the gelatine from the water, squeeze out any excess water then whisk it into the hot syrup. Whisk well making sure it all dissolves, then strain and add to the rest of the syrup. Pour the syrup into martini or wine glasses and stand in the fridge to set. This will take approximately 4 hours. Serve the jellies with fresh cream.